"Tamani looked at her gravely, and reached up to touch her hair behind her ear. He hesitated for an instant, then his hands found the sides of her face, pulling her to him. He didn't kiss her, just held her face to his, their foreheads resting together, their noses almost touching. She hated how much it felt like good-bye." 1. (+/-) Laurel, the protagonist - I feel like this also comes out of me being older than what I was when I started the series. I liked Laurel then, but now after having read so many other YA books, I don't really feel like I know much about her personality. She's of the healer, gentle type, she's beautiful like most faeries, she's smart enough to mix a bunch of different potions, and she has great instincts (which help her with her Mixer abilities). But I'm still distanced from who she is, and while reading, I didn't feel particularly attached to her. 2. (+) World-building - Mostly this comes in the form of faerie weapons, what Klea comes up with as a Mixer, and what winter faeries can do with their powers, but it was all nice to discover. Aprilynne Pike's got quite a handle on the mythology she's created. 3. (+) War & its Consequences - This is one of those few books that has war in it and has an author who's not afraid to kill off characters or make the consequences grisly. I particularly liked the ending and how that relates to this. 4. (--) High School Drama - In the beginning of the book, there's quite a bit of the high school drama. Chelsea likes David, and David still loves Laurel, and Laurel loves him and Tamani, and Yuki loves Tamani, but Tamani loves Laurel... And this complicated sphere of crushes & love gets discussed, sometimes in terms of in the future, and I kind of wish those sections had just been cut. 5. (+/-) The Romance - Not my type of romance anymore. I wish I'd realized this earlier, but I wouldn't say it's a fault of author so much as the genre. I'm tired of how extreme these paranormal romance relationships are--you're in your teenage years, and you're ready to say you're going to spend the rest of your life with said person? I find it especially hard to believe in Laurel's situation because she was caught in a love triangle, and deciding between David and Tamani was hard for her since she loves them both. On a more positive note, I like Tamani as a love interest, and I like that though they have a pretty extreme relationship, he's not controlling. He's still of the protective/I'll die for you variety, but he and Laurel let each other make their own decisions. 6. (+) Love Triangle Ends Gracefully - Thank God for a love triangle that doesn't end with the author taking a lame approach to ending it. Laurel makes her decision and sticks with it. 7. 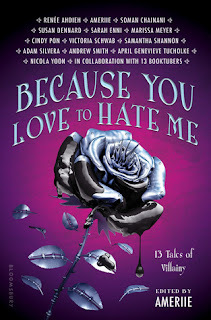 (+) Author's Note - You don't get to read very many YA books that have author's notes, but I really liked reading what Aprilynne Pike had to say about her series. It's interesting to see how her vision for Wings compared to what I thought of the series as a whole, especially considering what I thought the series had revolved around. 8. (+) The Writing - Pretty simple, pretty easy to read. Definitely for younger teens. 9. (+/-) Pacing - It kept climbing and climbing because the war was ongoing, but this was what made the climax seem weak in comparison. The climax had to be HUGE in order to compensate, and it didn't feel that way for me. 10. 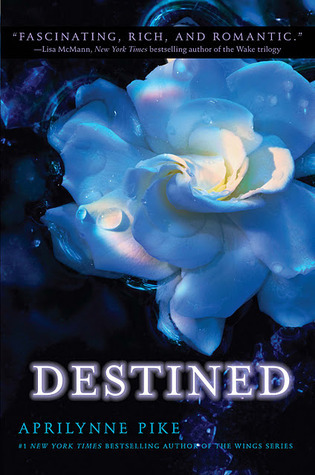 (+) The Cover - The covers don't really tell you much about the books, but they do follow the blossom/faerie as a plant deal, and I like how the blue color in this one captures the sadness following war. Fans of the Wings series should enjoy this conclusion and all the tidy ends Aprilynne Pike ties for her characters. Great review! I actually thought they should of just combined this book with the last one. This one was so short and it felt like the author just wanted to end it very fast.